Update (6/24 1:00pm): Save an additional $15 with code CSUMMERFUN2016 until 5PM PST. 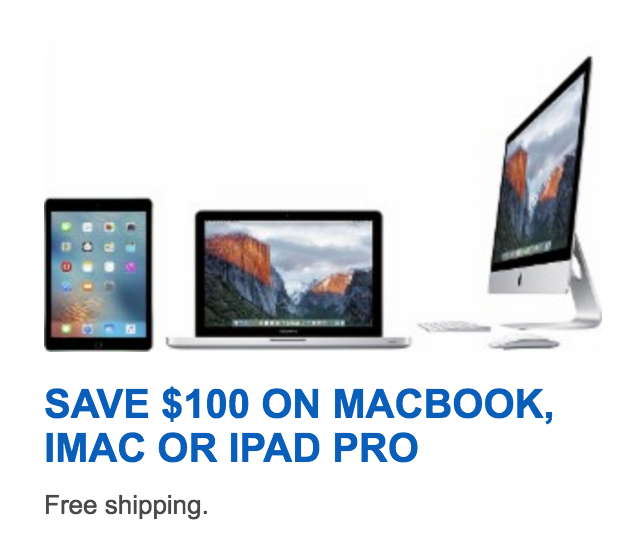 Electronics Valley via eBay Daily Deals also has this 13-inch Retina MacBook Pro for $1,039.99 shipped. It’s a better deal at eBay if you have access to a .edu email address, otherwise this listing if your best bet. Best Buy offers the Apple 13-inch Retina MacBook Pro 2.7GHz/8GB/128GB (model MF839LL/A) for $1,099.99 shipped (Reg. $1,299). Those with access to a .edu email address can drop the final price down to $999.99. That’s a match for the strongest discount that we’ve seen on this model. Either way, you’re getting one of Apple’s most popular MacBooks at a nice discount. Features include a 2.7GHz dual-core Intel i5 processor, 8GB of RAM, 128GB flash storage, a 3840×2160 display and the new Force Touch trackpad. Protect your new device with a wool and leather 13-inch MacBook sleeve. We still have Apple’s latest 13-inch MacBook Air on discount for $830 shipped (Reg. $999). The 13.3″ MacBook Pro Laptop Computer with Retina Display (Early 2015) from Apple is a powerful notebook computer with an innovative, ultrathin, ultraportable aluminum unibody design. It is loaded with advanced power management features and an integrated lithium polymer battery, which work together to provide up to 9 hours of wireless web browsing. The widescreen, LED-backlit IPS screen has a glossy finish and a native resolution of 2560 x 1600. With 227 pixels per inch, this MacBook Pro has a pixel count of over 5 million. You’ll be able to output to 2 external displays at up to 2560 x 1600 via Thunderbolt 2 (Mini DisplayPort). Any Mini DisplayPort-compatible display will plug in without the need for an adapter.